Using KioCall, a video conferencing app from KioWare, kiosk users can initiate and receive video calls to pre-configured Users, Kiosks, and/or Groups of Users with the click of a button. Adding video conferencing to your kiosks opens up a world of real-time interactive support options available directly from your kiosks. Using KioCall, a video conferencing app from KioWare, kiosk users can initiate and receive video calls to pre-configured Users, Kiosks, and/or Groups of Users with the click of a button. The most common uses of KioCall are video conferencing, screen sharing, and queue calling. KioCall is perfect for call centers, kiosk-to-kiosk communication, customer service, group chats, and any time live support interaction from a kiosk is needed. Anything you would normally do when offering customer service can now be done through interactive video chats using KioCall. Kiosk users can speak to a sales rep, reach customer support, get assistance with a purchase, speak with an expert, make a reservation, and more. Read more about the benefits and uses of kiosk functionality. Kiosk users click the call button to initiate a live video call. Using the KioCall app, an individual on the receiving end instantly answers the call and provides a live interaction via real-time video chat. KioCall is easy to use and adding KioCall to your kiosks is simple too. For that there are three components: 1) the KioCall admin dashboard where you manage your account, 2) KioCall support within KioWare, which is managed through the configuration tool, and 3) the KioCall app that can run on any Windows device. Let’s see those three components in action. At https://admin.kiocall.com, your KioCall admin dashboard displays a snapshot of your real-time KioCall activity as well as current account usage status. This is where you’ll go to manage your account, Users, and Groups of Users. To allow a kiosk user to place or receive calls, the kiosk needs to be running KioWare for Windows version 8.9 or higher, or KioWare for Android version 3.11 or higher. KioCall works with all models of KioWare for Windows and KioWare for Android: Lite, Basic, and Full with Kiosk Management. The KioWare for Windows and KioWare for Android configuration tools make it easy to add a call button to your user interface so kiosk users can place a call. When KioWare is running, the kiosk user just needs to hit the call button in the toolbar to place a call. To place or receive calls on devices that are not running KioWare, the device needs to be running the KioCall app. You can place a call by selecting one or more Kiosks, Users, and/or Groups, then click the Call button. When receiving a call, click the green video button to accept or the red X to reject. Here’s one example of what you might see when using the KioCall app to connect. To end the call, just hit the red Disconnect button. Interested in adding KioCall to your kiosks? KioCall is simple to set up and use, it’s reliable, and it’s completely affordable. 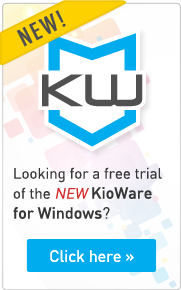 For KioWare, you’ll need to purchase KioWare for Windows or KioWare for Android in Lite, Basic, or Full with Kiosk Management. Contact us if you’d like help deciding which model best fits your needs. A license is needed for each of your kiosks and devices that need to be securely locked down. For KioCall, you’ll need to purchase an annual subscription per device and/or app user as well as a block of prepaid call minutes. The quantity of KioCall subscriptions you need is based on the number of active KioCall devices you’ll have at any given time; active KioCall devices are any combination of connected kiosks plus logged-in KioCall app users. A quantity discount starts at just ten subscriptions, and KioCall minutes are available in blocks of 100 hours. If you have questions, are ready for a demo KioCall account, or need assistance with KioCall, just contact us and we’ll be happy to help.